kay, okay. We all know this isn't the case. While the Internet affords us the convenience of research at our fingertips in the comfort of our own homes from a plethora of sources, these sources may or may not be reviewed and regulated the way a reference source from the library is. You, yourself, may have even read something and took it as fact, only to find out later that it's not true. Below, are some points to bear in mind when teaching your children (or, maybe, refreshing your own memory!) how to evaluate web pages on the Internet. 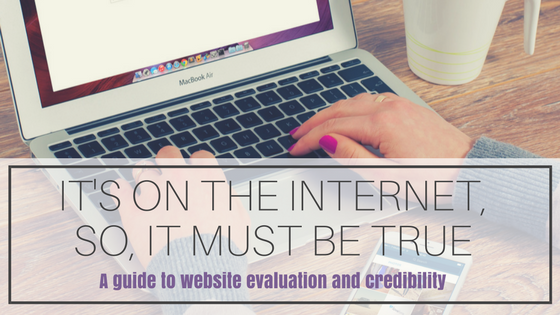 The author’s credentials are critical to evaluating the credibility of a web page. I mean, after all, there would be no content to evaluate without the author! A source is much more likely to be reliable if written by an identifiable person who is qualified to speak on the topic at hand. Ask yourself these questions, and take the answers into account while deciding whether content found online is trustworthy or not. Can the author's name be found on the page or elsewhere on the site? If the author is unidentifiable, what does the web address suggest about the site? Is there contact information (an e-mail address, phone number, mailing address, etc.) for the author? Are there credentials (educational background, degrees, work experience, etc.) listed for the author? Is the author affiliated with an organization? If so, is this organization sponsoring the page? Be sure to check when the page was last updated. A source is much more likely to be reliable if it’s current. If the page has not been kept up-to-date, then information on the page may be outdated as well. Both, the author’s intent for communicating their content, and the audience they are trying to reach, can influence the credibility of a source too. For example, if the author is trying to sell a product, the content may be biased toward the benefits and value of said product. Is the information presented intended for scholars/experts or the general public? What is the purpose of the page (to educate, to persuade, to sell a product, etc.)? What is the purpose of the site? Is the information provided supported by evidence and sources? Are these sources also credible? Does it appear to be well-researched? Is the content free of spelling and grammar errors? Are there any links? If so, do they work? Are they relevant to the topic? Is the information presented factual or opinion-based? As you can see, evaluating a web source is not a black-and-white process, but rather an art! It's important to do so, though, to minimize the risk of imparting false knowledge. I've summarized some main points to consider when judging whether a web page may have poor, okay, or strong credibility and compiled it into a free, printable evaluation rubric below. Where should we send your free printable?